ARCATA – Some Zappa alums are headed to town, and soon-to-be-former Eye Editor Kevin Hoover is all jibbered up about it. 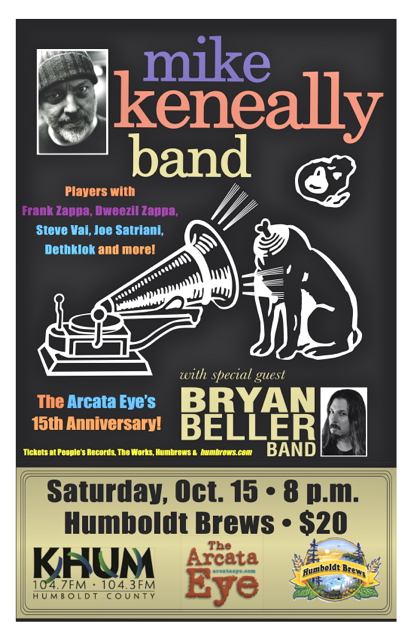 Former Frank Zappa guitarist Mike Keneally is headlining the Arcata Eye 15th Anniversary Bash at Humbrews, 856 10th St., Saturday, Oct. 15. Doors open at 8 p.m. Tickets are $20 and available at the usual places. Opening for the Mike Keneally Band is the Bryan Beller Band, which – spoiler alert – has the same members. It will be Keneally and Beller’s fifth Humboldt appearance in two decades. The two gigged with Beer For Dolphins at the old Jambalaya Club twice in the 1990s, at Six Rivers Brewery in 2005 and as a duo at the Arcata Theatre Lounge as part of the Arcata Eye Ball in 2010. On this occasion, they are bringing their full electric ensemble, featuring Mike on guitar and keyboards, Bryan on bass plus guitarists Rick Musallam and Griff Peters and drummer Joe Travers of Zappa Plays Zappa. The former host of the Zappa’s Grubby Chamber radio show, Hoover will be a guest on Mark Scatchard’s Zen through Zappa show on KHUM, 104.3/104.7 FM this Friday night, Oct. 7 at 10 p.m.
After completing the secret Zappa handshake but likely foregoing a re-enactment of the Mud Shark, Scatchard and Hoover will attempt to discuss matters Keneally, play some of his music and give away tickets to the Eye Bash. More at arcataeye.com and on Facebook. This entry was posted on Monday, October 3rd, 2011 at 11:49 am	and is filed under News, Scene, Calendar, Media. You can follow any responses to this entry through the RSS 2.0 feed.